All of the month of February, I'll be showing paintings at Walter's Ice Cream Shop at 6408 32nd Ave. NW. They're going to be part of the Ballard Art Walk on the evening of the 15th, so if you're in the area, stop by. This tile job just went home yesterday. It features the view from the clients' home on Puget Sound. They live near Bremerton, so the ferry from Seattle goes by all the time, and Navy and Coast Guard ships are always in the area. So are the gulls, herons and cormorants. One panel of this will go behind their stove, the other under a window and out onto the backsplash on either side of the sink. Registration is now open for a workshop that I’m really excited about. It will be china painting taught by Kurt Weiser and me at Anderson Ranch Arts Center in Snowmass Village, Colorado June 11-15. This will be "The Contemporary Master" and "The Guy Who Wrote the Book" together for the first time, at one of the country’s most wonderful schools. It will also be a showcase of two wildly different approaches to china painting. Kurt and I make different stuff for different reasons and put it out in the world in different ways. He works slowly and deliberately; I work fast and loose. He uses oil medium; I use water-based. He makes what he paints on; I don’t. 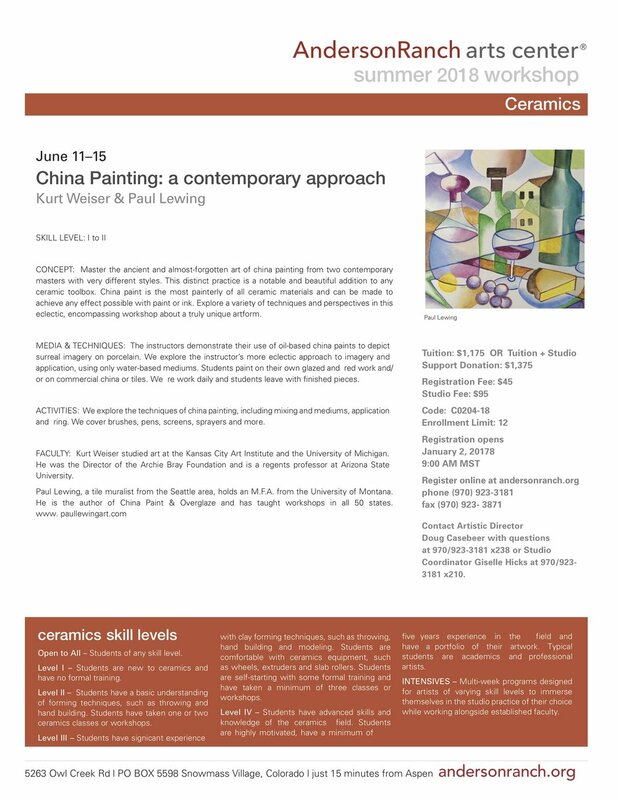 I would dearly love to see a mix of clay artists and traditional china painters at this workshop. To register go to andersonranch.org or call (970) 923-3181. Do it soon, and tell your friends. Registration has just opened and I think this one will fill up fast. This picture was just sent to me by some folks who bought these at my recent holiday studio sale. I think they make a very nice grouping. They are 9" x 12" and 12" x 12". Not much happening in the studio this time of year, but There was this nice little sign for a vineyard in San Mateo, California. I've been woking hard lately getting ready for the annual sale at my studio. It will be odd this year not having Gay Jensen's fiber work with me for the first time in 31 years. And Kathy Dannerbeck, sho has had her jewelry here for the last 6 years, will also not be here. So this year I have two new artists, who I'm really excited about. 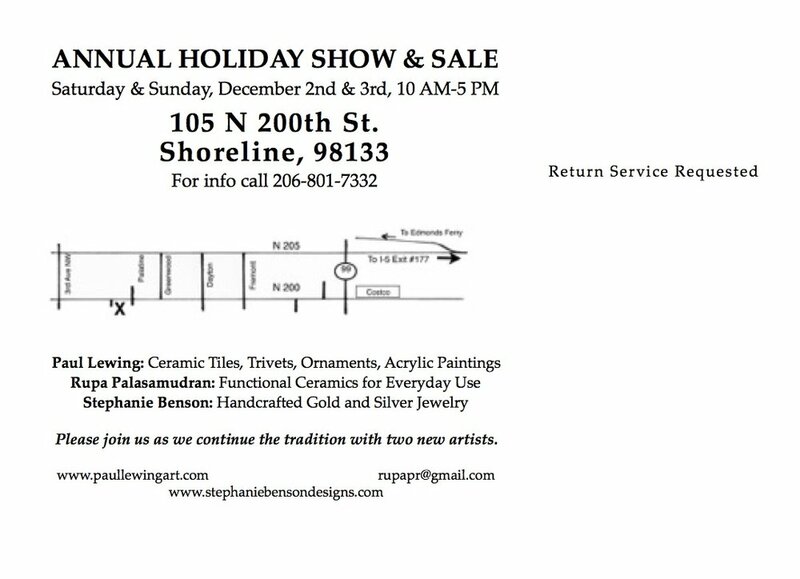 Rupa Palasamudran will be showing her stoneware and porcelain pottery and Stephanie Benson wi;ll be showing gold and silver jewelry. Here's what our card looks like, with hours and directions. Here's a new pice, just out of the kiln yesterday, that went home today. It's a map of Whidbey Island, for a shower wall up there. It's 5' x 7' on 12" x 24" tiles. It's got a lot of fun images on it: the North and South Poles, Bunnies around Langley, New York and Florida way off to the east, and a kraken eating the Victoria Clipper. I just got back from a week in front of a video camera in Mississippi. I was filming an online china painting course for TeachinArt.com, a new online school run by Antoinette and Koos Badenhorst. The source should be ready to go live about the first of the year. As part of the demo for the class, I designed and painted a tile piece featuring the Mississippi state bird, tree, flower, butterfly, animal and fish. Here's a picture of me working on it. I'm off to Mississippi to record an online china painting class on Friday. On Saturday I'll be doing a demo there before we start filming. Anybody who's in the area is welcome to drop by. Here's the announcement they've put together. I haven't been in the studio much lately. I've been out doing what I refer to as image harvesting. I did a three-day backpack trip, two nights at Paradise Inn on Mt. Rainier (thanks for the birthday present, Ruth!) and a four-day canoe trip on Ross Lake in the North Cascades. Here's a picture from Mt. Rainier. I'm planning another backpack trip for next week, so I think I'll have plenty of images to work from this winter.